Over at Fidelity.com, which I have to admit I do check out from time to time as they can provide some pretty good investment advice. If you ignore the funds and pitches for their high-priced mutual funds then it is ok! Anyway, one of their most recent front-page articles concerns investment income and ways an investor can work to boost it. I got excited at first because I thought it might have to do with dividend investing. As the tag-line for the article states, "With interest rates low worldwide, here are seven strategies to amplify the yield on your investments — with the risks and rewards of each". However, it was not to be as the article really covers a number of fixed income alternatives that investors can consider. The seven yield producing alternatives are presented in the image below. As you can see, these are of a primarily fixed-income variety. 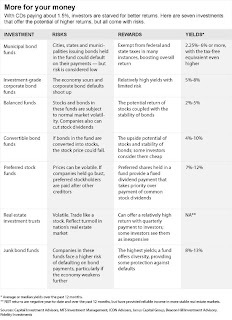 Other than the REITs and preferred shares most are bond funds of various types. Personally, when I use fixed income investments in my own portfolio I look to them for safety and not necessarily additional yield. Fixed income investments should be safe and have very low risk. I am not saying you should not use these other yield producing assets, but they should fit in with the riskier portions of your overall asset allocation. You should still ensure that your real fixed income investments are as safe as possible, such as in short-term bonds and TIPS. That is my opinion - what do you think?